DIRECTOR'S MESSAGE HIGH FREQUENCY MARK MASUOKA JOHN S. KNIGHT DIRECTOR AND CEO For nearly a century, the Akron Art Museum has expanded its community bandwidth and tuned into a cultural frequency that has kept the museum purposeful and, at times, even a little provocative. Nonetheless, we are constantly on the leading edge of contemporary art and life. The museum remains committed Photo by Bruce Ford to providing a high level of service to our community and to perpetuating a mission to enrich people’s lives through modern and contemporary art. As we enthusiastically embrace this new year with artistically authentic exhibitions and socially relevant public projects, our vision remains focused through the lens of social change and civic engagement. Our current exhibition, Nick Cave: Feat., and the artist’s upcoming community performance HEARD∙AKRON, further reinforce our conviction that art is for everyone. At the heart of Nick Cave’s social and studio practice is his belief that art can engender connectivity and compassion. Our partnership with Akron Civic Commons has provided the perfect opportunity for the museum to further its commitment to bringing contemporary art and performance directly into the community and to working together to build a transformative, inspirational and empowering experience for all. Capitalizing the museum’s future operations and public programs while establishing a proclivity for growth, a fluency toward innovation and a generative intention for capacity building. Reimagining the Akron Art Museum experience by aligning our institutional vision and values with our belief that art is for everyone. Our commitment to diversity, equity, accessibility and inclusivity is the cornerstone of our conviction that this organization must reflect and represent our community and the museum’s patrons. Creating a new value proposition that addresses the frequency and duration of museum visits through Akron Art Museum Everyday. #AAMEveryday shifts the conventional visitor paradigm by not just focusing on increasing our supply—but by growing the demand for meaningful art experiences. We accomplish this by raising our expectations and capacity to make a daily art-powered visit to the Akron Art Museum the best part of your day. We are equally energized to begin the planning process for our centennial anniversary in 2022. The opportunity to celebrate such an institutional milestone has as much to do with the legacy of the Akron Art Museum as it does with the opportunity to shape the vision of the museum for the next 100 years. Our focus continues to be on delivering the museum’s values of Enrichment, Engagement and Excellence. We are guided by our steadfast commitment to make the Akron Art Museum inclusive and accessible to everyone each and every day. Thank you for your support, and please join us in actively supporting and participating in the process of making the Akron Art Museum YOUR art museum. NC: All of it. I’m disgusted with the national rhetoric and how we talk to each other, and I’m concerned about how I can continue to bring us together and diversify my work in celebratory ways. I’m also interested in bringing out a queer perspective in the work, which no one ever discusses or asks me about. The decadence of being a fabulous queer black man—what does that look like, and how do I celebrate that? You’re black, you’re queer, you’re an artist—the mainstream doesn’t get any of those things, really. But all of that has been the fuel that has kept me fully in my body. I’m wanting to express myself more in that direction, with less of a focus on race. I’m excited to come to Akron and think about how we continue to feed young people with ideas and encourage them to dream. I’m just going to try to keep positive work out in the world. Nick Cave: Feat. was organized by the Frist Art Museum, Nashville, Tennessee. Supported in part by the National Endowment for the Arts. Its presentation in Akron is made possible through the generous support of the John S. and James L. Knight Foundation, Ohio Arts Council, The Tom and Marilyn Merryweather Fund, Akron Reimagining the Civic Commons and The Lehner Family Foundation. Additional support provided by Mr. and Mrs. Joseph Kanfer, the Akron/Summit Convention and Visitors Bureau and the Hilton Garden Inn - Akron. Media sponsorship provided by Western Reserve PBS. bring out all kinds of personal histories. They also raise the question of how we honor domestic crafts like crochet and needlepoint, which are becoming less and less a part of our day-to-day lives. I like celebrating these practices and things that have traditionally brought beauty into our lives. ER: You’ve said that you don’t think of the soundsuits as being fun, and you’ve made their purpose of concealing identity explicit, but how do you reconcile that statement with their undeniable visual magnificence? NC: I use those devices [beauty, sparkle, decoration] as a way to lure people into the work. I’m always thinking of how we open ourselves up to the experience—how do you let down your guard and stand up to something that is unrecognizable? That’s through imagery that we’re familiar with, but the work has always been politically driven, built around what’s going on in this country. I’m thinking about: How do I move past discrimination? How do I move past injustice? How do I reconcile police brutality? Because I don’t know that that’s ever going to be a thing of the past. So I’m asking myself how I can continue to deal with this current reality and yet proceed to a higher place? It’s personal to me, but it’s much bigger than me. It’s disturbing that to this day I still have to think about how I am going to get home if I’m out late at night—which route do I take to stay safe? Or if I’m on Michigan Avenue trying to hail a cab, and five cabs pass me by. So it’s just part of life, but part of life is how you still find beauty. I think my purpose is much greater than talking about the effects of injustices imposed upon me. The soundsuits hide gender, race, class, so we’re forced to look at them without judgement, which goes against our natural inclination to categorize everything we see. In that way, they challenge our sense of security, but they open up our imagination to see beyond what is on the surface. ER: Are there particular events informing the work that you’re making today or the way you think? 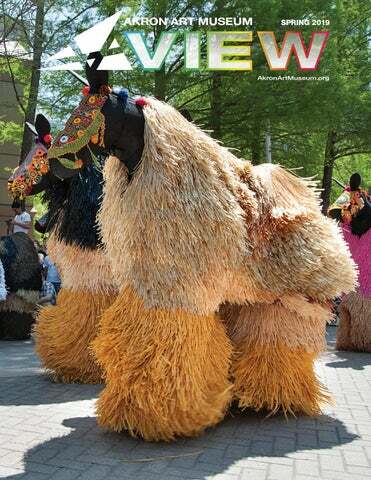 NICK CAVE H EAR D • AK RON April 27 • Performance at Summit Lake April 28 • Performance at Akron Art Museum Join us as world-renowned artist Nick Cave stages dazzling presentations of HEARD•AKRON on April 27 in the Summit Lake community and on April 28 at the Akron Art Museum. Please check the museum website and your email for more details. MORE ABOUT HEARD: “I was really thinking of getting us back to this dream state, this place where we imagine and think about now and how we exist and function in the world. With the state of affairs on the world, I think we tend not to take the time out to create that dream space in our heads.” —Nick Cave “Responding to the globalization of our cultural identity, the horses’ colorful coats reference a range of cultural influences, from contemporary fashion and Southeast Asian embroidery, to dress and ritual attire from around the world, most notably African ceremonial costumes.” —Demetrios Gkiouzelis, yatzer.com HEARD•AKRON is made possible through the generous support of the John S. and James L . Knight Foundation, Ohio Arts Council and Akron Reimagining the Civic Commons. Brian Bress: Pictures Become You is organized by the Akron Art Museum and supported by funding from the John S. and James L. Knight Foundation, Ohio Arts Council and The Char and Chuck Fowler Family Foundation. Mernet Larsen: The Ordinary, Reoriented is organized by the Akron Art Museum and supported by funding from the John S. and James L. Knight Foundation and Ohio Arts Council. Joe Vitone: Family Records is organized by the Akron Art Museum and supported by funding from the John S. and James L. Knight Foundation, Ohio Arts Council and The Char and Chuck Fowler Family Foundation. While video images of astronauts exploring the moon were broadcast live around the world to millions of television viewers, NASA also had the astronauts take still photographs to record more detailed visual information. This photograph, now on view in the Corbin Gallery, was taken during the Apollo 11 lunar landing. NASA/Bridget Caswell, London Price is mesmerized by the aircraft evolution of flight model in the NASA Glenn briefing center during a National Lab Day Event. Read more local transportation stories like this on the labels in the exhibition gallery. Or, share your own favorite travel story on Facebook or Instagram. Tag @akronartmuseum. Here is a sample menu for #AAMEveryday. Use the suggestions below, or create your own art-powered experiences. MONDAY Check your email for what’s coming up this week at the museum. Follow the museum on social media to get more information, updates, fun facts and more. Visit the museum website to go deeper into exhibitions, the collection and the museum experience. FRIDAY Meet up with a friend and find your art oasis in the galleries. Spend a few moments to relax and escape from all the hustle and bustle. Don’t forget to share your favorite artwork in our collection on social media. #AAMEveryday Stay active and get your 2,000 steps by walking through the galleries every day. Sometimes I just want a snack-size art experience at the museum. So I take a quick art break by looking at three artworks that are related in some way. I call this particular art break, “All About the Face,” because I chose three portraits. First stop: a 1937 painting by Zoltan Sepeshy called Young Mother. Yeah, we get it. Artists have been painting mothers and children forever. But Sepeshy was a modern guy—for the 1930s—so he painted regular people, like this lady. She’s even sitting in a slouchy regular-person way. That’s what I like about her. Plus, she’s rocking the Frida Kahloesque eyebrows. A portrait without a head? I’m breaking all the rules. This guy makes me super nervous but I love him just the same. It’s complicated. The artist Yinka Shonibare MBE was teetering between his Western and African identity. He was also thinking about the impact the West has had on Africa as he made this precarious piece. Finally, let’s look at James Gobel’s portrait, I’ll Be Your Friend, I’ll Be Your Love, I’ll Be Everything You Need. Check out this guy, mashing up plaid AND sequins. Gobel likes challenging stereotypical images of masculine and feminine, gay and straight, upper-class and working-class with portraits that pile on all kinds of different identities, like the heavy metal t-shirt and leopard-print robe. Side note: What song do you think he’s going to belt out? Hope you enjoyed this mini-tour! Connect with Dot, your new AAM digital tour guide. Whether you’re here solo or with a group, Dot will lead you through the galleries with fun ways to explore the art while you connect with friends or family, or learn about yourself. Connect with Dot on Facebook Messenger by typing AAM Dot into the Messenger search field, and she’ll lead the way. Whether you have been a member for years or are just joining us, we look forward to connecting with you and sharing art together! Join us for these special tours and events designed for our members! Register for any of the upcoming tours or events at akronartmuseum.org/ eventregistration, and start exploring your creative life at the Akron Art Museum. Space is limited. For questions about membership or membership events, please contact Senior Development Officer Jeneé Garlando at 330.376.9186 x222. TOUR GET TO KNOW YOUR MUSEUM Wednesday, March 20 • 11 am Whether you are brand new to the museum or have been a member for years, join Associate Educator Gina Thomas McGee for an exciting exploration of the museum’s collection through an interactive tour that will include museum surprises, secrets, fun facts to share with family and friends and tips on how to get special member discounts every time you visit! Art meets inventive play every first Thursday! Make a date to celebrate your little scribbler’s imaginative potential—wh ere the only adult expectations are meaningful messes and big ideas. This program encourages multi-age creative wanderings with sensory-rich, open-ended experimentatio n and selfexpression. Art smocks provided. Free for members, $10/nonmember child. *Registration required. Children must be accompanied by an adult. Creative Playdates are made possible with support from the Robert O. and Annamae Orr Family Foundation. Our open studio is the perfect place for caregivers and kids to express themselves and unwind. We’re tech-free with a quality-time-to gether guarantee! Hang out with other young visionaries and learn how to develop lifelong positive habits of the mind with fun, energizing art experiences. Don’t settle for bored and tired, get inspired! Every second Free Thursday. Free. *Registration required. Children must be accompanied by an adult. After-School Mind Unwind is made possible with support from the Robert O. and Annamae Orr Family Foundation. ber child. *Registration requ $5/member child, $10/nonmem by an adult. Children must be accompanied Tots Create is made possible Family Foundation. It’s a pint-sized artdate for caregivers and their rollers, sitters, scooters and dribblers. Park the stroller and cozy up in our circle of babes for sensory play, face-to-face bouncy rhymes and social games to inspire baby’s curiosity and build first relationships. Happy babbles and crying are welcome! After class, make time for coffee talk and play awhile in our baby-friendly space. BabyFest ’19, Featuring Nick Cave-Inspired COUture Diaper Crawl! $5/member child, $10/nonmember child. *Registration required. Art Babes is made possible with support from the Robert O. and Annamae Orr Family Foundation. BE INSPIRED BY ART, YOGA AND MEDITATION Thursday, March 14 • 6:30 pm • Inspired by Nick Cave Thursday, April 11 • 6:30 pm • Inspired by Mernet Larsen Thursday, May 9 • 6:30 pm • Inspired by Joe Vitone Enhance your health and experience the current exhibitions at the Akron Art Museum. Each month an all-levels yoga class will be presented in conjunction with a specific exhibition, providing an opportunity to stretch and strengthen your body and your mind. Led by certified Akron yoga instructors, this enriching experience is not to be missed. Bring a yoga mat and an open, creative mind. Free to members, $10/nonmember. Registration required at akronartmuseum.org/eventregistration. Yoga in the Galleries is made possible with support from The Henry V. and Frances W. Christenson Foundation and the Samuel Reese Willis Foundation. MORSE CODE BRACELET WORKSHOP Thursday, March 21 • 6:30 pm From plastic buttons and beads to sisal and feathers, Nick Cave takes everyday art supplies and configures them in new and fantastic ways. Bring your bestie to this interactive tour and hands-on workshop and create a Morse code message bracelet while delving into the messaging and movement in Nick Cave’s work. $10/members, $15/nonmember. Registration required at akronartmuseum.org/eventregistration. 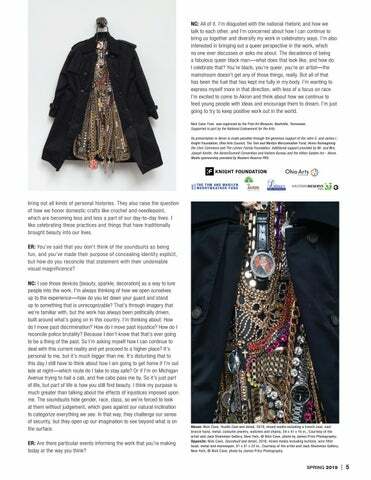 GALLERY DISCUSSION NICK CAVE: FASHION AND FLAIR Thursday, April 18 • 6:30 pm Is Nick Cave inspired by the fashion world or is the fashion world inspired by Nick Cave? Grab a gallery stool and join staff from Kent State University Museum and the Kent State University Fashion School for a discussion of Nick Cave’s connection to all things couture. Free and open to the public. Registration required at akronartmuseum.org/eventregistration. CAVE IN: A MASK & MOVEMENT WORKSHOP Thursday, April 25 • 6:30 pm Join Kyle Jozsa, Director of Education for theater troupe Wandering Aesthetics, for this expressive mask and movement workshop inspired by the creations and ideas of artist Nick Cave. Like Cave’s soundsuits, masks can camouflage, creating a second skin that conceals race, gender and class, forcing the viewer to look without judgment. Recycle your creativity in this unique introduction to theater techniques using found objects as masks in a relaxed and playful environment. $10/members, $15/nonmember. Registration required at akronartmuseum.org/eventregistration. READING UNDER THE ROOF CLOUD BOOK CLUB: OLD IN ART SCHOOL Thursday, May 2 • 6 pm Following her retirement from Princeton University, celebrated historian Dr. Nell Irvin Painter surprised everyone in her life by returning to school—in her 60s—to earn a BFA and MFA in painting. In Old in Art School, she travels from her beloved Newark to the prestigious Rhode Island School of Design, finds meaning in the artists she loves even as she comes to understand how they may be undervalued and struggles with the unstable balance between the pursuit of art and the inevitable, sometimes painful demands of a life fully lived. This compelling memoir addresses identity issues, such as age and race, while exploring what it means to be an artist. Join Akron Art Museum librarian Ted Pitts for a discussion of the book and a tour of the Nick Cave exhibition. Free and open to the public. Registration requested at akronartmuseum.org/eventregistration. BECHDEL FILM FEST Thursday, May 30 The Bechdel test, first appearing in Alison Bechdel’s 1985 comic strip, sets up three rules for evaluating films: at least two female characters, who are given names and who talk to each other about something other than a man or boy. Today, just half of films produced meet these simple requirements, and media aimed towards children and teens is even bleaker in terms of on-screen females with their own narrative arc. The Bechdel Film Fest celebrates the women, people of color and LGBTQ+ community members who are often overlooked on screen and highlights Akron as the inclusive community it is. Check www.bechdelfilmfest.com for screening times and registration. Thursday, May 2 • 6:30 pm Teachers are fantastic storytellers, with the ability to make any subject or idea captivating for students. In the style of The Moth/TedX/PechaKucha, you’ll hear tales from teachers of all kinds during this engaging, inspirational and entertaining event. You might even learn something! FREE. Registration required at akronartmuseum/eventregistration Each attendee will receive professional development paperwork to submit to his/her LPDC. NIGHT AT THE MUSEUM Night at the Museum events are made possible by Fifth Third Bank with additional support from the Robert O. and Annamae Orr Family Foundation. STUDENT ART SHOWS Don’t miss your chance to see the talent that lies inside our local schools by attending one of the museum’s Night at the Museum student art shows. OHIO ART EDUCATION ASSOCIATION’S YOUTH ART MONTH SHOWCASE On view Tuesday March 12 – Sunday, March 17, 2019 Students from Northeast Ohio will be represented in this show, featuring many schools in the area and a wide variety of artwork. NEW YEAR, NEW ART THE AKRON ART MUSEUM’S ART LIBRARY ANNOUNCES NEW ACQUISITIONS In celebration of the Akron Art Library’s anniversary, the museum has commissioned 10 regional artists to create works of art for the lending collection. These acquisitions will be available for checkout this spring at the Akron-Summit County Public Library Main Library with nearly 40 original works of art to select from. Any Ohio resident with an Akron-Summit County Public Library card is eligible to borrow works of art from the Akron Art Library for up to four weeks at a time, just like checking out a book. Each artwork comes with a unique frame and customized carrying case for easy transporting. The collection is housed in and circulates from the Culture & AV Division of the Akron-Summit County Public Library Main Library, located across the street from the museum. New acquisitions to the Akron Art Library include paintings, illustrations, photographs, fiber art, mixed-media collages and prints. Artists whose work has been included in the second iteration of the art library include Lizzi Aronhalt, Ron Barron, Christi Birchfield, Alexandria Couch, Brooke DiDonato, Mike Gable, Lauren Mckenzie Noel, Andrea Meyers, Darius Steward and Adana Tillman. To learn more about this and other related programming on collecting, caring for and displaying art, visit akronartmuseum.org. FREE EVERY THURSDAY ALL DAY • 11 am – 9 pm Spend Thursdays at the Akron Art Museum—it’s FREE all day and all evening. Check our website—akronartmuseum.org—for the most up-to-date information on what is happening on any given Thursday and the rest of the week. Join as a new member on Thursdays (in-person or online) and receive 25% off the regular price! Full details available at akronartmuseum.org/memberships. Free Thursdays are generously supported by the J.M. Smucker Company. MEMBER SPOTLIGHT: LAURA FINK AND STEVE LEDERER How has the Akron Art Museum impacted you? We bought our first piece of original art through the museum. It was a piece by Joe Walton. Now we are inspired to buy one original piece of art every year, oftentimes in place of Christmas gifts. Laura loved Jun Kaneko: Blurred Lines. Steve loves the Fred pencil sketch of the little bird by Beth van Hoesen. Both of us love the winter scene Bach Chord by William Sommer. We both think that the Inside|Out project was amazing! Why do you feel art is important? We both believe that art is timeless and has merit, no matter when it was created. We appreciate the vision and patience that goes into art. Above all, we love the fact that we all view art through different lenses. Different people can look at a piece of art and see completely different things. Do you have a story or memory that you would like to share about the Akron Art Museum? We had our first date at the Akron Art Museum. The date is forever etched in Laura’s brain: July 5, 2012. We also got engaged at the Inverted Q a few years after we met there. What made you decide to become a member of the Akron Art Museum? We decided that it is a small price to pay for valuing the arts in our community. We consider it a privilege to live close to an accessible art museum with great programming and fun special events. How frequently do you visit the Akron Art Museum? At least once a month, but more in the summer. What benefit of membership do you appreciate the most and why? Member preview nights. Art museum staff goes out of their way to make guests feel welcome and appreciated. Your membership supports the Akron Art Museum in its mission to enrich lives through modern and contemporary art. Memberships begin at just $50 for individuals and $75 for families. • Unlimited Free Admission • Access to Exclusive Art Experiences • Discounts in Shop and Café • Complimentary Parking And for those culture seekers wanting more, we have memberships that provide national reciprocal museum privileges, invitations to member-only experiences and much more! Art Works Business Memberships also available. Share the joy of LIVE CREATIVE with your employees today! Join today! For yourself or as a gift by calling Jeneé Garlando at 330.376.9186 x222 or by visiting akronartmuseum.org/memberships. My favorite AAM experience was a Downtown@Dusk event last summer. I attended with members of the Akron and Cleveland Salsa Community, and we danced salsa, bachata and merengue to wonderful live Latin music in the outdoor pavilion. What I enjoy about the Akron Art Museum is it encompasses more than just physical art pieces, and it encourages the entire community to experience different forms of art including music, dancing and food. One of my favorite experiences while working at the Akron Art Museum would have to be speaking with Holbrook Riles III (aka HR3) after his drum performance in the Jeff Donaldson: Dig exhibition. We discussed how his performance was inspired by Donaldson’s work and how Donaldson’s work has inspired other African American artists, not only in Akron, Ohio, but also around the world. Whenever I’m exploring the galleries, I always gravitate to Mickalene Thomas’ Girlfriends and Lovers. There’s something about the calm confidence of the women in the work, along with the mixed media and complex patterns, that fascinates me. I always find something new whenever I see it. ALBERT MACSO, OWNER & OPERATOR, AKRON, OHIO What made you decide to have your business become an Art Works Business Member? From the early stages of building Akron Coffee Roasters, the Akron Art Museum has supported the business. Before we had a brick-and-mortar shop, the museum allowed us to hold coffee classes and tastings here, and used our coffee in the museum café. It seemed only natural to bring the relationship full circle. How frequently do you visit the Akron Art Museum? We love offering our great team the opportunity to visit the art museum for free. The opening receptions are fun to attend to socialize with familiar faces that we don’t always get to see outside of our shop. How has the Akron Art Museum impacted you? Your business? The region as a whole? The Akron Art Museum helped ACR get its start early on, providing an outlet to get the Akron Coffee Roasters name and coffee to the public. Our coffee is served in the museum café and the museum has acted as classroom for various coffee classes and programming we offer. Are there particular works of art in the collection or current/past exhibitions that are special to you? Our staff has several favorites—the Inside|Out series, Jun Kaneko: Blurred Lines, Sky Hook by Gene Davis and Untitled by Mark Rothko. Why do you feel the Akron Art Museum is important? The Akron Art Museum is a great asset to our community, offering opportunities for creative outlets that appeal to all levels of creativity and creative interest, and acting as a cultural staple to downtown Akron life. Do you have a story or memory that you would like to share about the Akron Art Museum? Supporting a creative life requires commitment and passion. As we strive to create an inclusive, interactive and accessible public arts space for all, your support makes it possible for the Akron Art Museum to serve its mission of enriching lives through modern and contemporary art. Your annual fund donation provides much needed financial support to continue programs in our community. • World-class modern and contemporary exhibitions • Education programming for over 7,000 local K-12 students • Public art projects like Akron Art Library and art experiences in the Bud and Susie Rogers Garden Make your gift supporting your creative life TODAY! Return the enclosed envelope, call Jeneè Garlando at 330.376.9186 x222 or visit akronartmuseum.org/donate. ART WORKS BUSINESS MEMBERSHIPS For more than 95 years, the Akron Art Museum has been able to realize its vision thanks to the dedication of the community. Demonstrate your company’s commitment to the arts with an Art Works Business Membership at the Akron Art Museum. Corporate support is critical to the museum’s ability to present its world-class exhibitions and acclaimed education programs. In return for your generous support, our Art Works Business Membership program provides special benefits and recognition specifically designed to meet the needs of your business. Join the growing list of companies demonstrating support for the arts in our community. Akron Children’s Hospital Akron Coffee Roasters Arthur J. Gallagher Risk Management Services, Inc. Best Commercial Energy Services Beyond Borders Inc. BPI Information Systems Brennan, Manna & Diamond, LLC Central Graphics & Signs Cohen & Company Dominion Energy Ohio EarthQuaker Devices Edenscape LLC Emery Electric, Inc. Famous Supply Fidelity Investments Grants Plus Harwick Standard Distribution Corp. H & M Metal Processing Co. The J.M. Smucker Company Lake Business Products Myers School of Art Ohio CAT Printing Concepts Risk International Services, Inc. Roderick Linton Belfance LLP S.A. Comunale Company, Inc. Securitec Security Systems Sequoia Financial Group LLC Sikich LLP Speelman Electric, Inc. Star Printing Co., Inc. State and Federal Communications, Inc. Suncrest Gardens Sweet Mary’s Bakery Sweet Modern/Cogneato TKM Print Solutions, Inc. United Way of Summit County Western Reserve PBS Join online at akronartmuseum.org/memberships or contact Senior Development Officer Jeneé Garlando at jgarlando@akronartmuseum.org or 330.376.9186 x222. Tuesdays through Fridays 11 am – 4 pm That’s right: The museum’s Summer Studio has a new-and-improved home for 2019. Beginning after Memorial Day, the Corbin Family Foundation Gallery will be transformed into a studio where visitors can explore, discover and create. Families can make memories together in this creative workspace designed for children, their caregivers and anyone who wants to tap into their imaginative side. The hands-on, inspiring play space will offer visitors a drop-in experience, encouraging families to experiment with a variety of art-making techniques and materials with no registration required. Children must be accompanied by an adult. Free for members every day. Regular admission applies to nonmember adults, with the exception of Free Thursdays, when admission is free to all. Summer Studio is made possible with support from the Robert O. and Annamae Orr Family Foundation and the Charles E. and Mabel M. Ritchie Foundation. 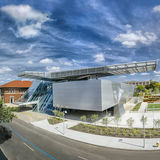 A MEMORABLE EVENT DESERVES AN EQUALLY MEMORABLE SPACE Choose the Akron Art Museum to celebrate the most important moments of your life and career. Exhibit your style with bold and dramatic art, iconic architecture and an elegant garden space which will wow your guests and make any occasion a rare and memorable celebration. OUR SERVICES & STAFF Our special events team is ready to assist you with customizing your event. Combine your corporate event with a tour of our collection, or add a unique outdoor feel to your dream urban wedding—our team can bring your visions to life. • Wedding ceremonies and receptions • Seated dinners • Luncheons • Holiday parties • Cocktail receptions • Photo sessions • Presentations, films, lectures and panel discussions Choose from our list of approved caterers who will provide you with a variety of menus and excellent service to accommodate your individual style and budget. Event rentals also include a museum event supervisor, security service, janitorial services and ample time for your caterer and vendors to set up prior to your event and to clean up afterward. The Akron Art Museum thanks everyone who supports us through annual gifts, membership, event sponsorship and special contributions. The listing below recognizes those individuals and institutions supporting us with cash gifts and pledges totaling $250 or more and celebrates our Director's Circle* and membership for their meaningful commitment to supporting creativity in Akron. Listing as of January 31, 2019. Akron Art Museum One South High I Akron, Ohio I 44308 return service requested. postmaster: dated material. do not delay. Join us for an evening of fabulous art, fine wines, great food, wonderful friends and a one-of-a-kind experience! Support the museumâ&#x20AC;&#x2122;s mission of enriching lives through modern and contemporary art. Your philanthropy helps the museum to provide meaningful art experiences and opportunities to live a creative life to all. 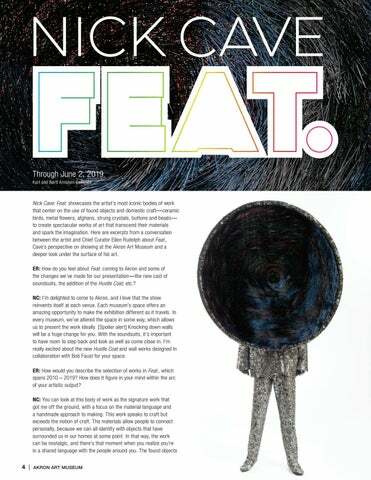 Artist Nick Cave speaks about his Soundsuits, showing Nick Cave; Feat. at the Akron Art Museum, the notion of craft, his use of found and recycled materials, contemporary art, and how his artwork addresses themes of race, sexuality, and queerness.